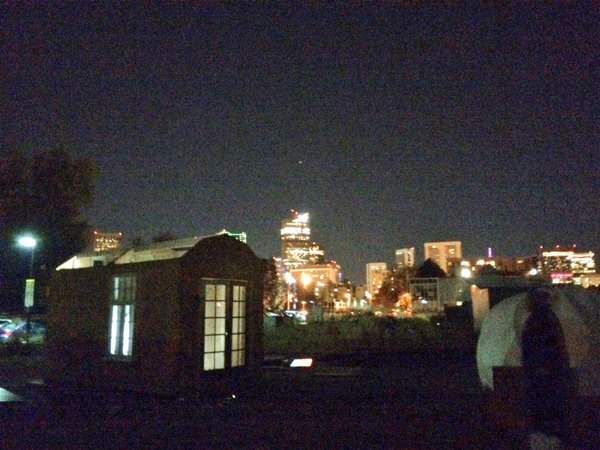 Resurrection Village is a project to set up tiny homes for homeless Denver residents. 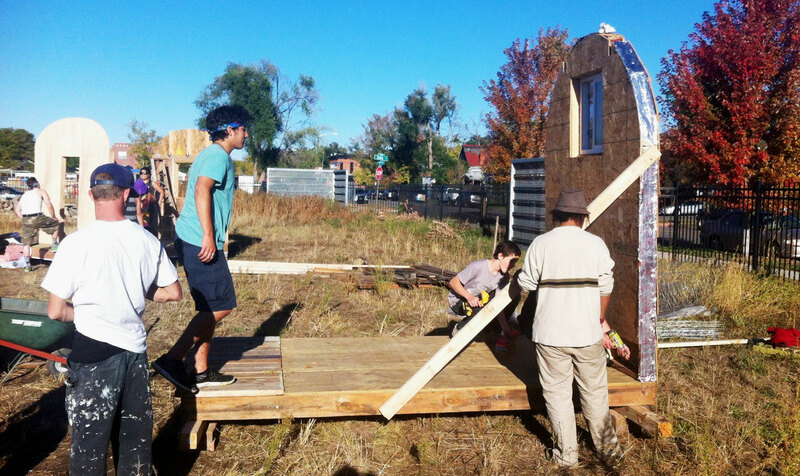 Five tiny houses were built on Saturday by Denver Homeless Out Loud [DHOL] and their supporters on a patch of land owned by the Denver Housing Authority, a public agency which has torn down hundreds of low-income units and is in the process of forking the land over to private developers, accelerating the gentrification of the Curtis Park neighborhood. Tiny home dwellers intended to stay over the winter, before land developers were scheduled to break earth in Nov. 2016, more than a year from now. “We want to bring awareness to the fact that this is public land. The DHA is a public entity that has a responsibility to the people of Denver… We want to remind them that they are accountable to the people of Denver and the communities who already live here.” – Karen S.
Saturday’s events were organized in Sustainability Park at 2500 Lawrence St., which is ironically the park’s legal name. 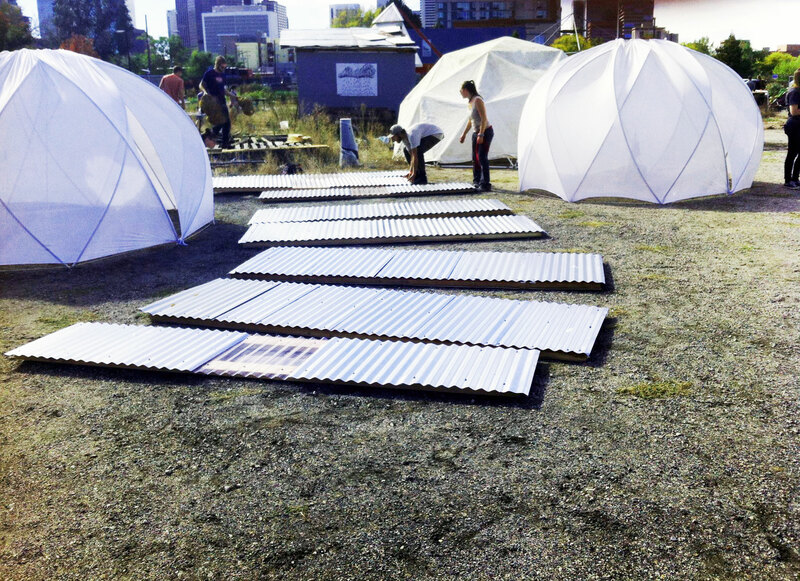 The Urban Farmers Collaborative has been on site for 5 years, pursuing three tenets of permaculture: “earth care, people care, and fair share”. 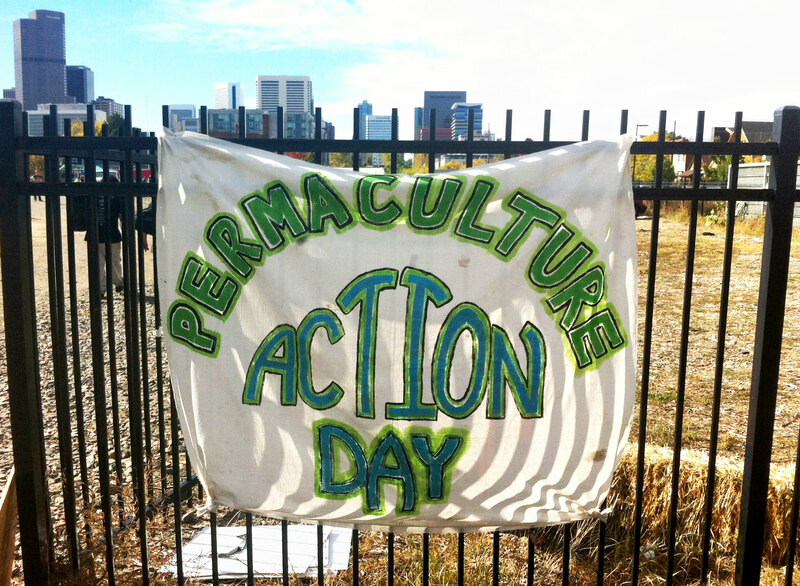 A Permaculture Action Day was held to move the urban farms that are being displaced from the park. The day featured a fully-functional kitchen with two grills. They served gluten free chard wraps with rice and potatoes to the volunteers as well as neighbors. People gave their sweat and time helping to transplant fruit trees and growing beds, and some local businesses donated materials in support. Live music was performed all day with amplification, poetry, gardening, and an herb walk to learn edible local plants or “weeds”. As a Farmer, as a Permaculturist, I’m thrilled to be here and to be organizing this! Because we’re bringing the true essence of permaculture here: We are bringing the people care, we’re bringing the justice and the issues of who has access to land, who has ownership of land, who has privilage and who is oppressed, who doesn’t have a voice and who does, and trying to mix it up and trying to have a stand on the right side of history.” -Karen S.
Separate from the permaculture events the tiny home builders began their work constructing #ResurrectionVillage. After darkness fell on the 24th, heavily armed Denver police arrested 10 people and the tiny homes were ripped apart and loaded onto trucks, a mass expense considered more important than finding affordable cheap shelter for residents. In 2.5 minutes, the following time lapse shows the entire sequence from camp setup to destruction on Saturday night spearheaded by SWAT style Denver Police, ordered by the DHA to sweep out the houses and arrest the builders. It also shows 2 of the houses being taken away in full. Time lapse video recorded by Laura Goldhamer. The Denver Police told reporters that they have given all of the buildings and supplies (estimated at least 5k worth) to DHA. DHA has stated that they are intending to return all the materials and tools to Denver Homeless Out Loud, however that has yet to happen. The 10 people arrested were all charged with trespassing and bonds set at $100 each. Within hours of the arrests the full amount to post their bonds was raised online through the Denver Anarchist Black Cross. All but one were released by the Sunday afternoon, with the last released early Monday morning. The story has attracted viral attention with writers like Lee Camp calling attention over social media. On Sunday night at 8PM, supporters of DHOL rallied at 25th & Lawrence, monitored heavily by Denver PD. They camped for the night, directly across the street from the developer’s house with signs and food for all to share. TreeHouse Brokerage and Development look to profit from inflating housing prices in the area. Developer Ryan Tobin lives across the street and is listed on the real estate development page of the DHA. On Monday night, DHOL and others held a press conference outside of City Council. They delivered a petition with over 14,000 signatures to repeal Denver’s urban camping ban that criminalizes the homeless. UnicornRiot.ninja has been on the ground providing live streaming video every step of the way. Please check out our archived videos here!